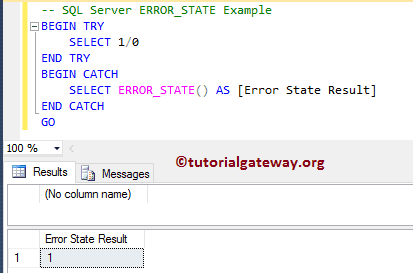 SQL ERROR STATE is one of the SQL System Function which returns the state of the error (if occurred). This function works within the scope of a CATCH block. If you call this function utside the CATCH block, it will return NULL. For example, we write series of statements inside the TRY block. And if server finds error then Sql Server ERROR_STATE() inside the CATCH block will be executed, and return an integer value. 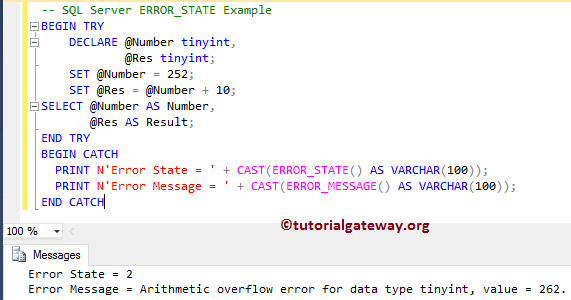 In this example we are going to show you, How to use the SQL Server Error_State function to find the error severity. This is another example to demonstrate the error state function. First, we declared two tinyint variables. Next we assigned 252 to @Number variable, and then we added 10 to that variable which will become 262 (Result).